Interested persons can become a certified tour guide through The National Tour Guide Training Program, which consists of the General Core and Professional Core modules, and Specialization training. 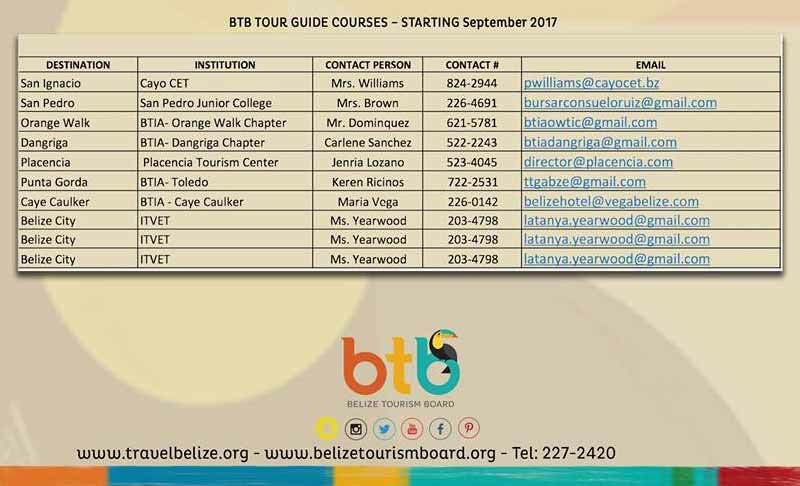 The General Core modules include basic knowledge such as history and geography of Belize, Belize's governance structure, an introduction to Belize's tourism product, laws and regulations about or impacting tour guide and tourism activities, and contemporary issues affecting the Belizean society. The Professional Core modules include a more in depth training of Customer Seruice, Promoting Tourism Products and Services, Developing Workplace Communication Skills & Techniques, and Conducting Tours. After completion of the General Core and the Professional Core modules, participants then select a specialization training (e.g. Archaeology, Birding, Advanced Marine, Dining, etc.) to complete the training program thus paving the way for application of his/her tour guide license. Thank you, that is what I told him but some people think they know better than the law! Learn the hard way! I'm a Belizean Tour Guide born in the USA. A decade or so ago I was told by the BTB I would have to become a citizen to keep my job so i applied for citizenship and got it. Yes, a fluke beginning but I developed patriotism in my struggle to live here. I'm now a proud Belizean and love my country. Every once and awhile I hear some remark about discriminating between born in Belize and naturalized citizenship. I usually dismiss it and consider the source an uneducated misinformed redneck type of person but when I'm pointed out as American Born Belizean by a government agency I'm ready to fight. Belize is a young country and government needs some time to mature. There are citizens and there are non citizens but no citizen is less of one because of where they were born.